On ne s'appuit que sur ce qui resiste. Cloud of words present in this page, circling is used to link word with similar meanings. linked by symbolic one-way function (OWF). If distinct layers have intrinsic properties rather than being a construct resulting of the level of analysis of researchers, how did those appeared and remained stable? Why is computation across layers remaining difficult? Why is there a costly increase of complexity while evolution is not a directional process? Explicit and hierarchical conceptual toolbox. have to consider it from another layer? which axioms from graph theory hold? if distinct layers exists and are not just the result of levels of analysis, how is it that they remain stable and that computation across remains difficult? is OWF the stabilizing mechanisms that allows for complexity to grow relentlyessly despite its energy cost? Note that in simulations OWF can just be simulated as weight on edges, there is no need to actually use proper OWF e.g. costly factorization of primes. In the same way hardness amplification can be simulated by increasing the value of the weighted edge. Relaxing this constraint by setting equal weights on the 2 edges of the same vertex can be use to test stability then controllability without OWF, if this allow for growth in complexity then SIA does not hold. If OWF are required though exploring the threshold value if there is one could yield very interesting result, percolation models could be helpful there. e.g. phylogeny of OWF in DNA genomes? consequently one could expect a fractal "trace"
consider its opposite, what is falsifiable? 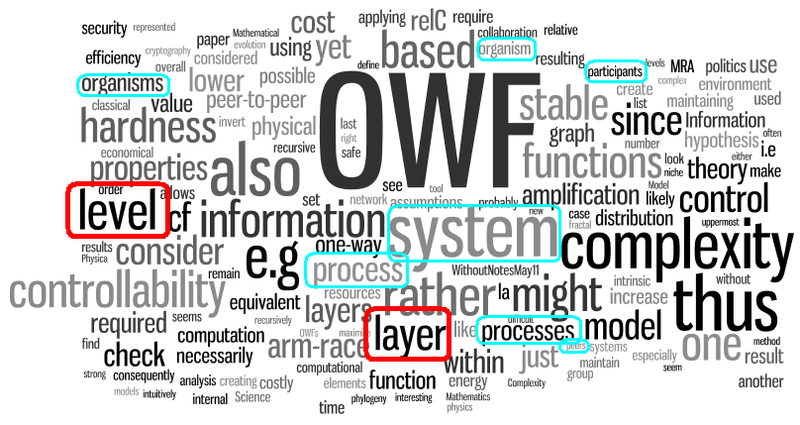 is there a complex system that does not rely on OWF? are there no OWF in nature? overall is the distinction between an OWF and other functions meaningful? is it too blurry a family of functions? Those remarks should be grouped and overall structured, currently they seem to be independent assumptions rather than a coherent and ordered pieces of information. The objective is to bootstrap the explanatory process to reach the explanandum in the most efficient and safe fashion. is a bi-directional OWF relation equivalent to a classical coupling relationship? but the underlying levels of an inefficient uppermost level would necessarily in some aspect reflect this inefficiency. The situation could remain sustainable for as long as required resources are not depleted faster than generated. are there any efficient evolutionary computation method (EAlgo, EGrammar, DirectedPrograming, ...) for hardness amplification? metaphor of "the natural evolution of controllability (thus politics)"
This section should also be organized in layers and their exploration should be systematic. Which way to follow, ascending or descending hardness should be considered. Logical implications have to be considered as hypothesis that can potentially invalidate the proposal iff they are implausible. is it meta-stability? does it require a "bottom" layer? can it be auto-stable? but also experience as a young kid of try to build a safe entirely out of classical Lego bricks yet knowing it was not correct and eventually could never be (cf CognitiveDevelopmentFailure#MyFailureAsAKid) and also Emergence on organized layers. are layers appearing "distinct" solely because of complexity of computation between each scale or models (e.g. chaotic system, combinatorial or power law)? is it the results of arm-race leading to niche exploitations and those niche are only safe thanks to the computational cost? if so what would be the consequence to algorithmically defining a unifying model? why is the 2nd law not sufficient? esp. can it explain growth in complexity? if FERD applies, does it involve topological requirements thus similarities? e.g. organization of components with identical function between a CPU and a city? Is there a tool like Zotero or Mendeley that allows to draw a hierarchical network with the thesis to write as the root and with for each cited paper displays its references as sources and its future citations (e.g. using Google Scholar or Microsoft Academic) and dotted lines in between? counter intuitively Algorithmica would thus not necessarily but so exciting by providing no affordance for complexity to "grow on"
"combined TRNG, intelligent searching algorithm and cryptographic designing principles to automatically design cryptographic algorithms and EVOC can not only resist DPA attacks but several mathematic analyzes." seems to be using chained encryption which does look like recursive use of OWF! Define vocabulary a la Wikipedia, first occurrence begs for a link to a dedicated page, since it pulls from multiple domain. See generated via wordle.net (through @w Vimperator macro) to gradually restrict to the minimum glossary. Consider regex or manual search-and-replace. does it also drives Wikipedia:Allometry#Allometric_scaling ? is it at least compatible with it? existing research of biomimetics applied to cryptography? overall there seem to be an implied consensus that organism directly consuming or leveraging by recombination simpler organisms (lower layers) are "positive" whereas simpler organisms e.g. cancerous cells, virii, ... leveraging more complex organisms are "negative"
is it relevant? is it a viewpoint bias? can those be considered counter-example to theoretical economical impossibility to invert OWF in nature? one could consider Society itself as a processor, especially according to my Beliefs#B1 thus with its upper-most layer as an equivalent of "software"
if so, what would be its instructions set? what would the links between policy and science be? yet can this be justified? is it always the case? are those tools to be even considered as layers in the first place since they are abstractions? are artificial attempts like Wikipedia:Program synthesis , Wikipedia:Evolutionary computation or automated Wikipedia:Proof theory remaining inefficient precisely because they are not taking into account the constraints that non-artificial processes are taking into account solely because they have emerged in a very restricted environment? i.e. is there an inverse relation between how high a layer, how generalist it can and thus how important embedding the right constraints is to remain efficient? limit rare cases to explore? If you can read this text (opacity=0.08) if means the page has not been edited for a long time. Consequently the information it holds might be deprecated or no longer represent the opinion of this author.